Here’s my IBOL II Bundle. This time, I dove into the little used bin of dressmaking fabrics and pulled out a few pieces that were in the one to two yard ballpark. I found a pinwale corduroy, eyelet, a nice stripe and a sheer that was meant for curtains. Hopefully someone else will make good use of these fabrics since I’m obviously not getting around to doing anything with them. I don’t have many large pieces of quilting cottons, but I found a few that I either had big plans for but they fell through or I used a lot less of the fabric than expected. I think they are fun happy fabrics and hopefully someone else will too. I was also teh recipient of excellent swag at Quilt Hawaii, so I wanted to share that wealth as well. Who doesn’t love metallic threads — at least to look at and dream. Of course, I had to include top stitch needles to sew the metallics with (since I had a whole pack). If you are interested in de-stashing and sharing our collective fabric wealth with our sewing sisters in Iraq, check out my hubby’s IBOL II blog for all the pertinant details and regular updates. Give a little. Yes, IBOL is back! Hubby is still here in Hawaii for the time being, but a lady named Nahed, who is part of the Provincial Reconstruction Team in the same area IBOL Guy was assigned to a year ago, is taking the reins for IBOL II. Here’s the most important thing: Packages for IBOL 2.1 (because I hope there will be a 2.2 and a 2.3!) need to be in the mail not later than 01 October (that’s a Friday). Do you think you can do that? In the mail, not later than 01 October. That’s just over a month from now. Hello out there! 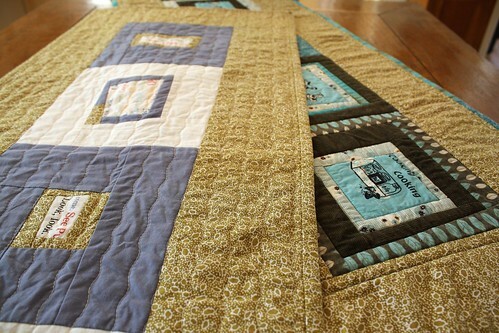 Do I have any readers on Oahu who want to make a few projects and learn some basic patchwork and quilting skills? Does anyone have a friend or two in the Waipahu area that wants to take a class? I’ll be teaching at Ho’ae’ae Community Park in Waipahu (Village Park/Royal Kunia neighborhood). Classes are Monday mornings from 10:00 until 11:00 (ish). Classes start on September 13th and run for ten weeks. The fee is a mere $20 though you should bring your own sewing machine and will need to bring your own fabric and basic supplies. Registration will be on August 25th from 6:00 – 8:00 pm and on August 26th and 30th from 2:00 – 5:30 pm at the park. That’s next week!! Any questions, leave a comment or call Ho’ae’ae Park at 808-676-8832. The address is 94-709 Ka’aholo Street, Waipahu for the map savvy. 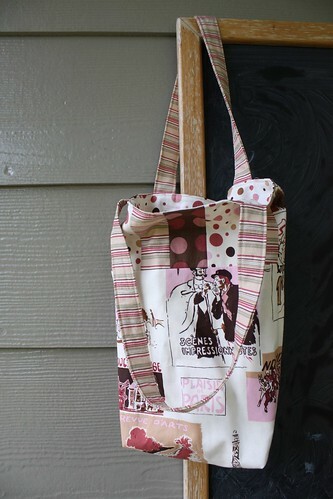 We’ll warm up our rotary cutters and strip piecing skills with a fat quarter friendly tote bag that’s the perfect size for a small gift or just a few necessities. 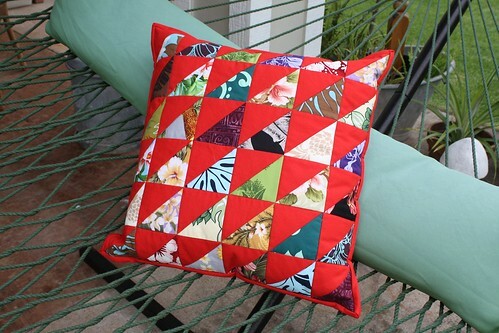 Then we’ll learn and easy way to make triangles and put them together in a fun pillow cover. We’ll also use this project to practice machine quilting and to insert a zipper and add binding. The final project is a Mod Log Cabin table runner. Log Cabin blocks are a quilting basic and these wonky ones are just the right amount of fun without worrying too much about accuracy. We’ll hone our quilting and binding skills on this project as well. Please spread teh word if you know anyone who would be interested! Aloha! Look what I did to my poor needle last week. It’s one of those fancy new titanium needles that are supposed to last a long long time. I was stitching along through many layers and “bam” this happened. Looking at the wreckage, I think that my thread caught on the spindle and so the pull of that versus my pulling because of the heavy layers pulled the needle just enough so that it came down not in the hole, but onto the metal of the stitch plate. And, being that it’s titanium coated and stronger, it bent instead of snapping! Warning: this is a long post, but if you’re interesed in fabric shopping on Oahu, it’s definitely worth the read. I went out for some embroidery floss this morning and came back with an armload of quilty/crafty supplies. My first (and originally planned, only) stop was Fiddlesticks. I needed a variety of lorikeet colored floss for my next 12×12 project and Fiddlesticks is really the only place on the island for anything other than DMC. The shop is primarily for cross stitch, but they stock such gorgeous silks and wools and glittery things, in addition to the stranded and perle basics, that I can’t imagine any stitch lover not enjoying the shop. Oh, and right now they have $5 grab bags. Mine had wool and cotton flosses and five cross stitch patterns which I think is pretty darn good for the price. Too bad I don’t really cross stitch. The ladies there are quite friendly too. I brought my partially completed quilt to match color and everyone oohed and awed; and then asked if I was participating in the quilt shop hop this weekend. Ooops, I had forgotten. Each summer the quilt shops on the island band together for a shop hop two weekends in a row. One could hit all the shops in one day, like I did, but it’s nice to have the option of taking a more leisurely pace. I’ve never done a shop hop on the Mainland, so I have nothing to compare this with, but it seems well organized and fun. Customers get a booklet with participating shops, and a stamp card (passport) at the first stop to get stamped at each store. At the end of the hop, full stamp cards get gathered and random winners are drawn to win prizes like gift certificates, fat quarters or even a new sewing machine! Each shop has special sale prices and a free quilt block pattern. I doubt that I’ll make a quilt with any of the patterns, but somehow, seeing each store’s contribution to the collection was fun and there seemed to be a kind of celebratory mood overall. So, I figured, as long as I was in town already, and hubby had the kids, I might as well join in and visit the stores. My first official stop was a half mile from Fiddlesticks at Bernina of Hawaii. This store is primarily about the machines, but they do have a decent supply of threads and some fabric. They hold regular classes and have a mechanic on-site. No one can compare to my Renate in Germany, but this store is OK. I had ordered the needle punch attachment for my Bernina over the phone, so I took this opportunity to check out the parts they did have in stock and see how long it would be until the other part arrived. I had a nice chat with manager Trish and showed off my half-done lorikeet quilt. I think they could use more examples of how people use their Berninas, and I could be a part of that…. Next stop was to US Sewing and Vac around the corner. I’d never been there before and was surprised to see that they had a largish selection of thread and fabric. Nothing that was up my alley, but good to know that it’s there. They are the place to go for your Singer or Viking machines. I bought vacuum cleaner bags. New Home was stop number three. Owner Ed has endeared himself to the entire Hawaii Quilt Guild. His tiny shop specializes in Janome machines but has other stuff too. Essentially though, I think that it’s his friendliness and helpfulness that have earned him a loyal customer base (or maybe it’s that faint Swiss accent). Unfortunately, I’m not in the market for a new sewing machine (unless I add a serger to the stable) so I don’t give Ed much business. I did buy a nice heavy thread cone stand and two spools of King Tut for an upcoming quilt. Several miles further on King street is Kuni Island Fabrics. I don’t visit Kuni often since it’s not in my regular geographic circle. They don’t have a lot of fabrics either, but they do have many loyal customers. I think what owner Terry’s (ooh, I hope I’m remembering her name right) got is a lovely boutique . She’s got a lot of patterns, mostly for bags, but also for clothing and quilted items. She’s also filled the shop with unique and colorful finished products. There are classes, and I think the shop is well connected to the community and the quilt guild. I think Terry organized the shop hop too. If so, kudos! I bought a cute little tissue holder for my purse. In addition to the free shop hop pattern, I was also given a little bottle of cold water — perfectly thoughtful considering shop hoppers would be driving around on a hot day. Again, kudos. Then it was off to my favorite neighborhood. Kaimuki has that college vibe, and there’s not one, but two wonderful quilt/fabric stores. First is my usual stop, Kaimuki Dry Goods. They cater to sewers too and have a large (for Hawaii) selection of everything. All those hip new fabrics on the internet? Yep. Awesome Japanese home decor fabric? Yep. Kona cottons in every solid imaginable? Yep. Two aisles devoted to batiks? Uh huh! I hate going to different places for different things, so this is my one stop fabric shop for my every whim except thread. The only drawback is that I don’t always get a welcoming vibe there. The more I go though, the more I think it is just an age and cultural thing. The majority of ladies working there are older and asian and I think that they just approach things differently than a much younger Mainlander. I will fogive them this because they have free parking and what I think is the best fabric selection on the island. I used my 20% off coupon (the only shop in the hop that required a coupon to get the hop sale price) to buy a yard of Echino fabric that will be great for a bag, but is normally more money than an impulse buy will allow. Up the street is The Calico Cat, a teeny place with crappy parking, but jam packed with fabrics. I want to buy everything just to make sure the shop stays in business. Carol, the owner, is so lovely and will often special order notions and other supplies. She carries my favorite Quilter’s Dream Cotton batting and has some felting and arty supplies. If I had to commit to patronizing only one shop, I think Calico Cat would be it even if it doesn’t have quite the breadth of fabric as Kaimuki Dry Goods. I like it’s funky, arty side and I like Carol’s taste in fabrics. Batting was in stock today, so I bought enough for a bed quilt. Because of the shop hop, Carol had cookies and chocolate covered kona coffee beans on offer for customers. Win! Back out in the neighborhood is a Bead It! which, though not my favorite bead shop, had the right location today. I bought simple seed beads for the lorikeet quilt. FYI, Bead Gallery around the corner from Bernina of Hawaii, and Bella Beads tie the for bead shops I’d make special trips to. Back in Kaimuki, there’s a toy shop my kids love (lots of Pokemon) and lots of places to eat. The surrounding area is also home to the Kahala Mall and KCC, a beautiful college which hosts a wonderful farmer’s market every Saturday morning. Not to mention that Oahu landmark Diamond Head is right there. I think I could love Kaimuki. From Kaimuki, on the far side of Honolulu from my house, I hopped on the freeway to head home. Just west of Pearl Harbor, I stopped at The Quilt Hut, which is tucked away in an unassuming looking industrial complex. I think The Quilt Hut may suffer from being off the beaten track because it has the reputation of not moving stock. This is too bad because while it doesn’t have quite the range of fabrics as Kaimuki Dry Goods, it’s not half bad either. It’s clean and bright and easy to find things, plus they sell my favorite Roxanne needles, there’s a nice classroom in the back, and they offer Longarm quilting service. It’s a LOT closer to my house, so just that in itself should make it a great shop. I think they could have a blowout sale of the current stock, buy a bunch of fresh looking Free Spirit and Alexander Henry fabrics and use the classroom to court the young sewists on the island and nearby military spouses. This would be the perfect shop to have their own special fabric like Quilt Passions in Kona on the Big Island has. Just saying. (BTW, Lizzy House had a good presentation at one of the Quilt Festivals regarding the next generation of quilt shop customers). Anyway, I did my part and bought four fat quarters to use as examples in my next class at the park. I also received a free fat quarter as my shop hop purchase prize. OK, brownie points for that! Not playing in the shop hop, but also in the industrial complex on Hekaha Street is Fabric Mart. This is the place to go for Hawaiian print cloth. The novelty hasn’t yet worn off on me, so I have all kinds of fun browsing here. They have pillow forms and trim and a wide variety of dressmaking and upholstery fabrics too. Their non-aloha print cotton fabrics tend to be low quality and boring deigns though, so I skip that area. Customer service is also hit or miss. Fabric Mart is a chain of sorts and also has location in town and on the Windward side. My favorite though, is the location in Kahului on Maui. It’s just cleaner and more organized, which adds immensely to my shopping experience. Back on Oahu, in the same row of shops as Quilt Hut, is Tracy’s Yarn. I went in expecting a knitting store, but it’s all about making sewn, knotted, or crocheted lei. I wish I had a need for everlasting ribbon lei because the possibilities are amazing. I marvel at Tracy’s handiwork on the walls. You gotta love a place where you can buy jumbo ric-rac not by the yard, but by the big-a** spool. It’s not all crafty stuff at the industrial park though. In fact, most of the shops are actually of the car detailing, stereo pimping, asian accessories, wholesale type. Hubby got a dent in his baby fixed there. We bought my daughter a bike for her birthday there. The Goodwill there has potential as well. And, last, but not least, it’s where our Taekwondo/kickboxing school used to be. So it seems to me, if you want it, it’s probably at the end of Hekaha Street, which even offers a nice view of Pearl Harbor. OK, one more stop to fill my shop hop stamp card. US Sewing and Vac in Pearl City. This is the closest place to my house and has no fabric at all. Bummer. They specialize in machine embroidery. Quilt Guild members tend not to go here at all, but there is always a clatch of ladies every time I go and I get the impression that they hold a fair number of classes on embroidery and that there’s a core group that just likes to come and hang out and work on projects. I tend to buy thread and vacuum cleaner bags there. They are obviously affiliated with the shop in Honolulu of the same name, but I think that Bernina of Hawaii is also under the same umbrella of ownership. Rosie, the manager, can be hard sell, but I do think she means well. When I mentioned off-hand that I would be teaching beginning sewing and patchwork at the local park, she was eager to get a flyer or info that she could pass on to interested customers since she really focuses on the embroidery angle. I bought wash away stabilizer to support the shop hop. So, if you’re on Oahu next weekend, I encourage you to join in the fun and try teh shop hop out yourself. If you just come to visit or are new to the area, I hope my comments are helpful. And, if there is a shop hop in your area I hope you can get out and support it. It’s quiet today and I’m having a hard time getting motivated even though I have a million things, both dull and exciting, that I could be working on. The kids are back in school and now, on my second morning with no one else in the house I’m feeling a lot more like curling up with a book or the cat than diving into a project. I have been slowly working on a few things. Too slowly, but that’s beside the point. 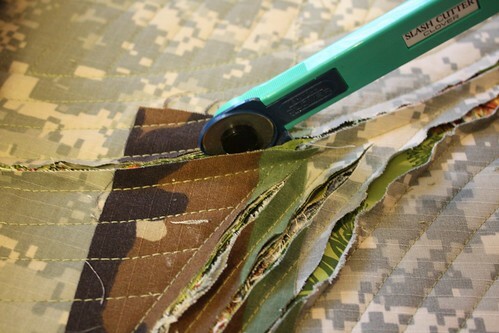 One of the “things” is a series of wall quilts dealing with being an Army Spouse. I’ve been trying lots of ideas and techniques. Some are speaking to me, some are not. I think that it is important to try new techniques and media, or test out concept and compositional ideas, but to do it without the expectation that what you produce will be the finished product. Maybe it will, but maybe it won’t — maybe that technique wasn’t the right one for the message after all, or maybe it’s got potential but needs some tweaking or combining with another idea before it’s just right. 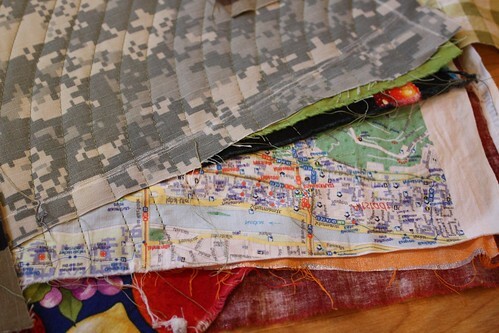 For this particular idea, I layered fabrics that had meaning to me and stitched a nice swirly pattern of channels over them. I slit the channels at different depths with a chenille cutter and also scissors. And finally, I cut away more to reveal more or less of the different layers. 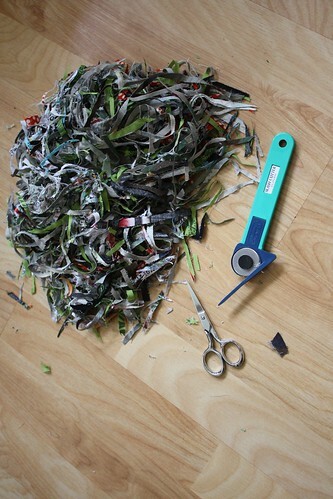 This pile is what I cut away. The finished product has potential, but this, my first attempt, was too shallow. I’ll undoubtedly apply this chenille technique to another go, but the fabrics themselves will have to have less obtuse meaning for the viewer. It was worth the essay though as an important step along the path. 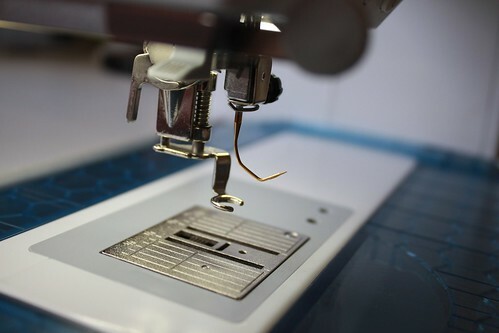 As more and more craft and quilting bloggers share their process, I think it is important to see that not all projects turn out perfect the first time and not all attempts are worth trying to save. This one will be shoved under the bed for now, having served it’s purpose, and the next one I make will be all the better for that.